>In a nail biter, Democrats hoping for a "total recall" of GOP seats in Wisconsin waited and waited last night to find out whether the 8th Senate District would seal or sink their hopes for a takeover of the legislature. After all other races and districts had concluded the night's vote tallying, MSNBC hosts were reporting it was "too close to call" at one point suggesting results might not come till the next day. ThinkProgress reported the Waukesha County Clerk Kathy Nickolaus said it would be over an hour before they had totals to announce for the 8th District where Democrat Sandy Pasch led Republican Alberta Darling with 68% of votes counted. Rachel Maddow signed off after 80% had been counted and there had been an acutely abrupt turnabout, with 75% of the votes going for Darling, or three Republican votes for every Democratic vote. This ratio exceeded the most disparate margins, even in the most conservative districts. Just before midnight locally, a spokesman for the WI Democratic Party chair Mike Tate was alleging vote tampering such as 'sitting on ballots', before the election was called. A bit rash without concrete evidence, his subsequent retraction is even more ponderous, pledging the party will not question the results, even after having an opportunity to analyze the ballot data. Even if Tate was making it up, this would still be news, but it was also interesting that candidate Sandy Pasch announced she would not be conceding tonight, or making any statements until more was known. Why was the extreme lateness of the reporting in Waukesha County particularly newsworthy? For starters, County Clerk Kathy Nickolaus had been roundly criticized for keeping the only copy of official election results on her personal computer in a outdated Excel program during April's Supreme Court election. In that race, Nickolaus stunned a nation in reversing the outcome of the election in favor of Republican David Prosser two days after it had been called for the Democratic challenger. One Member of Congress from the Waukesha area, Tammy Baldwin, asked for a DOJ probe into improprieties then, to determine why some 7,000 votes for Prosser had been temporarily "misplaced". Nickolaus had a controversial history even before April, and here we found ourselves again. MSNBC anchors Rachel Maddow, Ed Schultz and Lawrence O'Donnell had been covering the election live throughout the evening, but the channel went to reruns as the last race in question remained hung up. Two and a half hours after polls closed, only one of Waukesha County's 11 counting units had been tallied. With the nation watching and hanging in limbo, it was not MSNBC that got to the bottom of the delay, it was progressive blogger Brad Friedman who contacted Kathy Nickolaus directly, simply by calling the general office number. He asked her why her district was so far behind the others. About ten to midnight locally, Friedman was told three wards in the village of Menomonee Falls comprising the largest counting unit "were so busy they didn't get their absentee ballots done during the night, so they had to get them done after that". She said the municipal clerk there had "just faxed it to me 5 minutes ago". I'm not sure what "get them done" means, but if the absentee ballots weren't yet sorted or tallied, it sounds like they were basically just kinda laying around. Oh well. In the days leading up to the elections, alleged dirty tricks included hoax mailings by United Sportsmen for Wisconsin, a group headed by a former head of Americans For Prosperity (the Koch Brothers most visible front group) in which they promoted false election dates to voters. Due to concerns like these, exit polling was planned across the state, but was denied in one district only - the 8th District. The Waukesha official who prohibited exit polling admitted later he had done so on improper grounds, but only after it was too late to make up the research. Golly. This leaked result came more than 40 minutes before McCormack's later tweet reporting "with 96% of the vote in, News 3 is calling District 8 for Incumbent Sen. Alberta Darling". This suggests McCormack's Republican source, if credible, had inside knowledge of the Menomonee Falls count well before the press or public, raising more questions about what was going on in that counting site. While this all could be grand-scale mistakes or repeated incompetence with explanations, the fact that 'MSM'BC had their anchors hit the showers on such a busy night was weeeak - especially if they didn't know how the vote would go. If they did know about the impending GOP victory, they were among the last to report it, via a 'breaking news' screen crawl graphic ironically flashing below a taped rebroadcast of Schultz' audience cheering his announcement of Pasch's earlier lead. Not great television. While BradBlog called right in to Kathy Nickolaus, MSNBC lulled viewers to sleep with commercial after commercial. Talking to Maddow, Ed Schultz said a source had contacted a Menomonee Falls clerk who announced results would not be announced till the next day. Proven false quickly, this was simply outrageous considering there were less than 2,000 votes to be counted there. What could possibly take so long for "Republican activist" Nickolaus in the tiny 8th District where Waukesha saw a record-shattering $8 million dollars flood into the push to keep Darling's seat? With about 34,000 votes, this means over $230 was spent on every vote for Darling - including totally anonymous contributors. Waukesha alone made up about 28% of the total winning votes. With contributions for every 2010 state senate race in the US all added together totaling $3.75 million, you would think it newsworthy and even historical these six recall races in just one state saw an estimated $40 million spent. I might not be a fancy network exec, but it seems to me that win or lose, you want to keep people tuned in, not bore them, and suggest they "pack it in". With the unmatched rapier wits of hosts Maddow and Lawrence O'Donnell standing by at the ready, and news breaking of the DPW chair crying fraud, I'd think you stay with the live coverage, providing juicy background on unfolding events. As before, I have to wonder whether there is a disparity in passion for election integrity between Maddow and the other MSNBC hosts and their much richer bosses who, according to outgoing host Cenk Uygur, value "access" over truth, popular outrage - and even ratings. Like the other "insider" networks, they just don't question results. *UPDATE* Milwaukee news radio reported Wednesday on the explanation given by Waukesha officials for the late results, citing an unexpectedly large number of absentee ballots, more, apparently, then they were prepared for. As we know, the absentee ballots counted later in the process inordinately went for Alberta Darling, turning Sandy Pasch's earlier lead and pulling away to a 32% victory in the 8th district. In the Menomonee Falls turnout was reported high at about 65%, as was Mequon which collected 13% of votes by absentee ballot. When you consider that Koch brothers via AFP were caught mailing absentee ballots to Democrats in some areas that had a "typo" changing the due date from 8/9 to 8/11, you wonder if their voter suppression fraud was matched with any voter promotion fraud. We know RNC chair Reince Preibus provided outside funding for an "absentee ballot program", contact lists and staff on the ground to make voting easier in Republican districts, but exactly how "easy" did it get? It was also a hoot to see the RNC provide funding for a "voter ID" program, providing help for GOP voters just as they are hijacking state laws to make it harder for everyone else to vote without new ID cards. This could explain the heaps of absentee ballots overwhelming the 8th. While legal, this would certainly favor those with the most money. But what about these ballots, arriving so late in the game while the race was "too close to call"? As I understand, there is no easy way to see if they are fugazis - ballots are not checked unless there is a recount. After his election 'autopsy', mathematician Richard Charnin demonstrates how Tuesday's turnout not only suggests fraud in Waukesha, but claims all six races went Democratic based on Obama vs. McCain data, midterm data, Supreme Court election data and comparative analysis of turnout and historically probable voter defection rates. Turns out there is actually an ongoing investigation into Kathy Nickolaus, but it's in regard to her "laptop" and April's Kloppenberg/Prosser after-the-fact upset, not this week's elections. The Nation's John Nichols told Amy Goodman today that Nickolaus was also late in reporting last-minute "dumped" votes for Prosser in April, but it wasn't enough to win - until two days later when she found more. In one NY state assembly campaign for a Tea Party favorite, 17 counts of forgery and perjury alleged signatures of "likely" voters were actually "robo-signed". The charges came a year afterwards, and only because the accused happened to have denied witnessing the signers under oath in a civil trial. Because the media is not covering these stories (strangely, Drudge's page did not mention WI recalls all day or night) and official resources are so overtaxed, it's not likely election integrity will improve quickly - but Maddow started breaking the whitewash -- right before she got the hook. 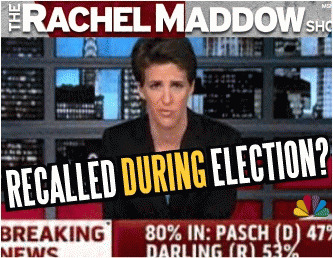 If you are an election integrity watcher, contact MSNBC or email Rachel "we read our mail" Maddow and ask her to spend more time on wild, weird Waukesha now so this does not happen again later.